Boyle is set to run in the local elections next year. 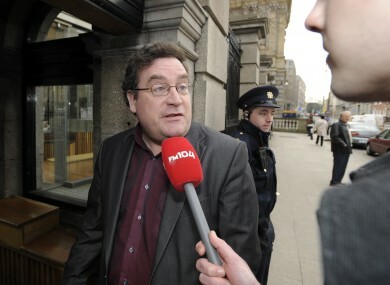 THE FORMER CHAIRMAN of the Green Party, Dan Boyle, is set to re-enter politics and run for Cork City Council next year. Boyle told TheJournal.ie today that he is “considering it and leaning towards” running for the council in next year’s local elections but a formal announcement will not be made until the party selection process is concluded next month. Boyle is a veteran of the Green Party who was a TD in Cork South Central from 2002 until 2007 when he lost his seat. Having helped negotiate the ill-fated coalition with Fianna Fáil, he was nominated to the Seanad by Bertie Ahern where he served until the last general election two years ago. “I’ve spent 20 years of my life in elected office, we suffered a severe setback in 2011 and I feel a personal obligation to keep communicating the green message,” Boyle said, adding that he would be an “outsider” in the seven-seat south east ward where he is likely to run. “I would only have half a chance of being elected at local government level,” Boyle said when asked if this was the first step on the road to running for the Dáil at the next election which is likely to be in 2016. “I’m far from a kid,” he joked. Email “Former Green Party senator Dan Boyle plotting political comeback ”. Feedback on “Former Green Party senator Dan Boyle plotting political comeback ”.